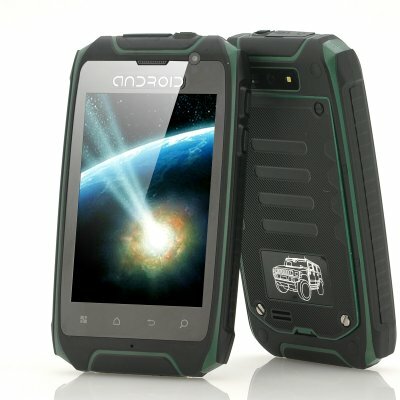 Successfully Added 3.5 Inch Rugged Android Phone "Meteoroid" - Waterproof, Shockproof, Dustproof (Green) to your Shopping Cart. 3.5 Inch Rugged Android Phone that is Waterproof, Shockproof and Dustproof is the perfect communication companion to accompany you no matter where or in what conditions you decide to go. Hard as a rock hurtling through space and blasting directly into Chinavasion’s warehouse is this solid 3.5 inch rugged android phone known as the “Meteroid”. Bang it and rough it up, this mobile can take a better beating than many other mobile phones out there. Also with an Android operating system it can be customized due to the thousands of downloadable applications that are on offer at Google Play. The “Meteroid” phone can also boast about having WiFi N, which is a more stable and overall better connection as well as having GPS to navigate you home after an adventure and Bluetooth as another means of connecting. There is a camera on either side of this phone, allowing you the ability to snap a shot from the rear of the camera or you could take a vanity shot of yourself. 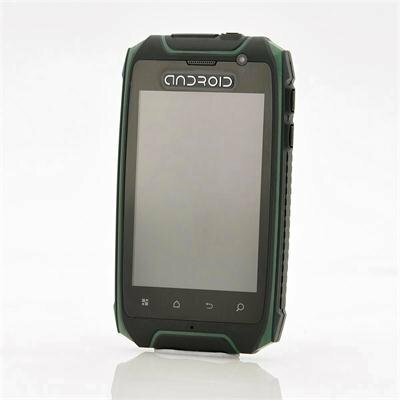 To keep up with the times this rugged Android phone has a 5 point capacitive touch screen that senses the conductive properties of your fingertips. A waterproof and dustproof rating of IP57 ensure that ingress of dust is not entirely prevented, but it won’t enter in sufficient quantity to interfere with the satisfactory operation of this mobile phone as well as being completely protective against contact. Also the ingress of water in harmful quantity shall not be possible when this mobile is immersed in water under defined conditions of pressure and time (Tested up to 1 meter of submersion). Shoot into this atmosphere with this tough and rugged Android “Meteroid” phone. This product is in stock and can be dispatched within 24 hours of ordering with a 12 month warranty. Brought to you by the leaders in wholesale electronics and Android phones, Chinavasion. прислали быстро,телефон работает отлично,по корпусу-угловатый,за эти деньги для работы на железной дороге-отлично.